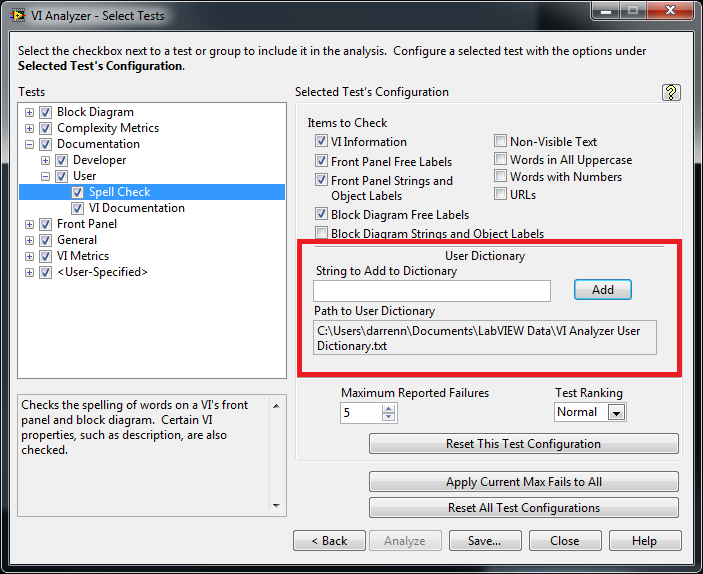 The VI Analyzer Spell Check test uses three separate dictionaries when checking a VI. This is the "standard" English dictionary used by the Spell Check test, largely based on the "2of12inf" word list found here. The word list was originally compiled in 2004, and has been updated manually on an as-needed basis with subsequent releases of the toolkit. This dictionary is stored in the following text file: [LabVIEW 20xx]\project\_VI Analyzer\_tests\Documentation\User\standard_dictionary.txt. The contents of the dictionary file are read when the Spell Check test first executes, and are stored for the duration of the current VI Analyzer session. The spell check against the standard dictionary is case insensitive. If you wish to modify the dictionary manually, make sure to keep the word list sorted, as the Spell Check test uses a binary search when checking words for a match within the dictionary. This is a dictionary including terms that are common in LabVIEW applications, but not necessarily standard English words. This list is updated manually on an as-needed basis with subsequent releases of the toolkit. This dictionary is stored in the following text file: [LabVIEW 20xx]\project\_VI Analyzer\_tests\Documentation\User\VI Analyzer Technical Dictionary.dic. The contents of the dictionary file are read when the Spell Check test first executes, and are stored for the duration of the current VI Analyzer session. The spell check against the technical dictionary is case insensitive. If you wish to modify the dictionary manually, make sure to keep the word list sorted, as the Spell Check test uses a binary search when checking words for a match within the dictionary. From experience, it seems like the first two dictionaries (standard, techincal) are case INsensitive, but the custom dictionary is case Sensitive. Is this correct? I just double-checked in the test subVI that checks against the user dictionary (that VI is LabVIEW 20xx\project\_VI Analyzer\_tests\Documentation\User\Spell Check.llb\Spell Check Strings--user dictionary.vi ), and yes, the user dictionary check is case-sensitive, while the standard/technical dictionary check is case-insensitive. I will update the document to include this information. P.S. - Most of the VIs in the Spell Check test are not password-protected, so you can browse the code in the test LLB to learn more about how the test operates.